Mid-range performance at a budget price. We've been documenting the fall in price of AMD's latest graphics cards recently, but we haven't yet dipped into the mid-range 4GB of memory territory. If you're looking to build a future-proof PC, 8GB graphics cards are the way to go. However, if you're on a budget, a 4GB card will still give you decent performance, and you won't be paying through the nose. 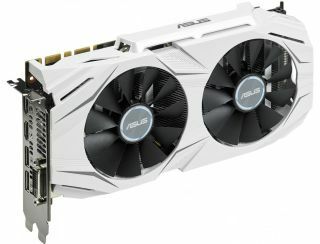 Overclockers has an Asus RX 480 Dual OC for £150 today, and as an added bonus you get a free copy of Doom thrown in. With this card you'll get a core clock speed of 1300 MHz, and a boost clock speed of 1320 MHz, while the 4GB of GDDR5 memory is clocked at 7000 MHz. That's a decent clock speed boost over the reference specs, but the memory speed is unfortunate compared to the 8000 MHz effective clock speed of the 8GB version. None of these are mind blowing stats compared to the higher powered and more expensive cards around today, but you'll be able to play modern games on medium settings quite easily. The 4GB RX 480 is also able to run VR, although, again, you won't get the best performance out of it. As for ports, you've got 1x DVI, 2x HDMI, and 2x DisplayPort, and of course as an AMD card it's FreeSync compatible if your monitor supports the anti-screen tearing technology. With AMD Vega on the way within the next few months, prices on existing hardware continue to go down, and this is the lowest price for an RX 480 4GB model available right now. Prices for this particular model fell sharply last month from around £215 to just below £170, and they keep dropping. Factor in the price of Doom, which is still around £30—£40, and for £150 you're essentially getting RX 480 performance at what were RX 470 prices just a few months ago.